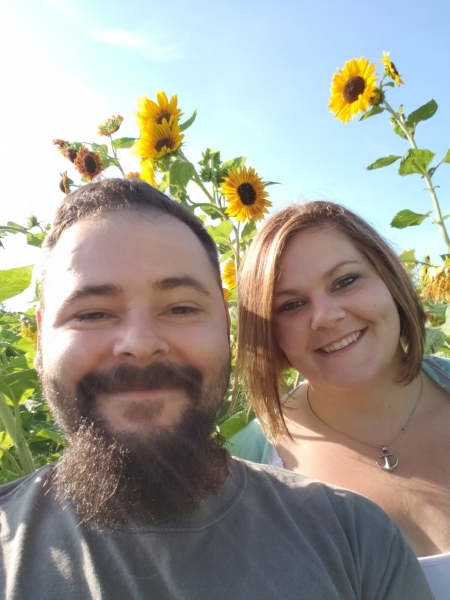 Adoption Profile - Adoption Story - Hopeful adoptive parents, Amanda and Chris, wish to adopt a baby. It all started in a high school algebra class. We soon started talking online every night and were casual friends for a while, not knowing that there was always something more. After graduation, we instant messaged each other once or twice every year and stayed in touch for several years...we then reconnected on Facebook and communicated, occasionally. One particular post on Facebook that Chris made, of his drawings that Amanda admired, sparked an ongoing conversation throughout that day. That evening, we decided to get together in person...that’s when we really realized that there was so much more between us! We enjoyed many adventures out in nature, realizing our mutual love for chasing sunsets...our strong friendship and deep love for each other grew and blossomed…we got engaged 8 months later. We truly are best friends! Our wedding was a celebration of our love...surrounded by our family and friends who shared in our special day! Our nieces and nephews think that we are the exciting aunt and uncle because we always enjoy doing fun things with them: throwing a ball, doing crafts, baking cookies or numerous other activities. There's never a dull moment with us when we are all together! Our families and friends are also incredibly excited to welcome a precious little one into our family with open hearts and arms! If you choose us to be the adoptive parents of your precious baby, please know that you will always be in our hearts and never forgotten. Your son or daughter will become a part of a warm and loving family and will always feel cherished. He or she will always know that you made the most loving and unselfish decision to allow them to become a part of our family. We promise a lifetime of unconditional love, laughter, support in every aspect of his or her life, as well as every opportunity for him or her to learn, grow and blossom into the incredible person that they dream to become. Feel free to contact us at (229)598-1363 specialdelivery4us@gmail.com. We look forward to hearing from you. Not only are we lucky enough to be living on the same property as Amanda’s parents, we reside in a top rated school district, in close proximity to the library, museums, galleries, the zoo, theaters, numerous parks and playgrounds, hiking and biking trails and numerous other great places for recreation. We look forward to taking long walks and bike rides as a family, and enjoy every possible opportunity that mother nature offers us to explore our beautiful surroundings! I'm a machinist at my father’s business. I started working there, full time, in 2005 and absolutely love my job. In 2010, I physically built my own home from the ground up behind my parents’ house with my dad, mom, sister and uncle. I never dreamed of being able to build it with my own two hands...but it happened! I grew up on the same property as I live on, now. I absolutely love my street. There is a park at the end of the street where as a young child and through my teenaged years, I would regularly go to. We have the same very close and friendly neighbors as have been there throughout my life. We are surrounded by wooded areas. I grew up playing basketball and softball at my grammar school. When I entered high school, my love for art came out. I took every art class that the high school offered. After high school, I acquired a greater appreciation for nature and began taking pictures while taking walks along streams and ponds and in the woods. I still love to do crafts. My friends continue to turn to me for creative help. I have three very close friends who I see regularly. My closest friend and I go to the gym together several times every week. Our favorite thing to do as a group is take walks and go for sushi lunch. I came from a large extended family who has get togethers for every holiday. My sister and I grew up being the best of friends and stay that way to this day. I have such happy memories from growing up and love making new memories! I am so thankful to have had such a wonderful childhood! My mom and I were always very close...until she passed away in 2005. Our favorite thing to do together was to spend an entire day doing jigsaw puzzles. Growing up, I played football, hockey and lacrosse. I did a lot of outdoor activities. My uncle used to take me fishing all the time, hiking and out on his boat in the swamps. I have always been very close with my grandmother, even moreso after my mom passed away and continue to be...I would garden with her and enjoy just sitting out in her yard talking. I have a younger sister who is married with two children. My niece and nephew mean the world to me! I enjoy spending time with them every Saturday. I have an older brother who I go fishing with, enjoy trips to comic book stores with and play disc golf with almost every weekend. I have a few close friends that Amanda and I enjoy going on day long hiking trips with. I love to draw and have an electronic drum set that I enjoy playing. In 2013, I went for a 7 day hiking trip to the Adirondacks with close friends. The scenery was breathtaking and was in awe when I got to actually feel the clouds on top of the mountain. I work at a local automotive parts company mixing automotive paint for several stores.